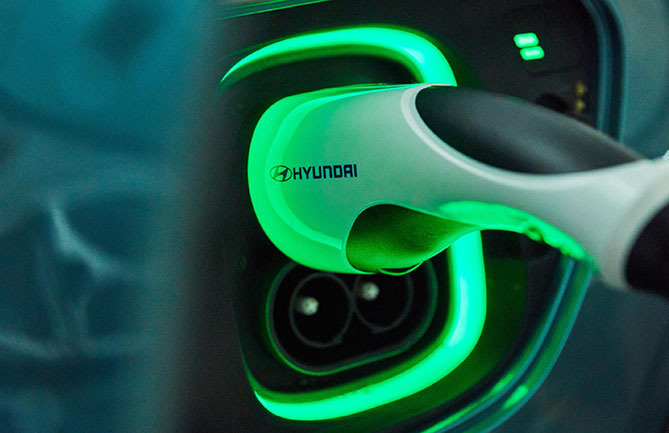 Hyundai first all-electric SUV, the Kona Electric, has arrived in Australia offering a long-range battery-electric powertrain and bags of advanced safety and connectivity features. Available in two model grades – Elite and Highlander – the Kona Electric drops with some stiff pricing of $59,990 for the Elite and $64,490 for the Highlander. While the pricing is steep and will likely put a frown on the brow of those hoping for something more affordable, any new EV is a welcome addition to the Aussie market. So what does a Kona Electric owner get for their money? Pretty decent performance for a start. 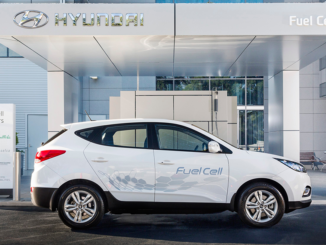 A 150kW electric motor powertrain gives the sporty-looking SUV the ability to travel up to 449 km on a battery charge (WLTP) and, if plugged into a 100kW DC fast-charger, an 80 per cent recharge in 54 minutes. In addition, the 7.2kW on-board charger allows battery recharging when plugged into a normal household socket, using the supplied In-Cable Control Box (ICCB). The Kona Electric produces 395Nm from its electric motor that can propel the SUV to a 7.6-second 0-100km/h on to a maximum speed of 167km/h. 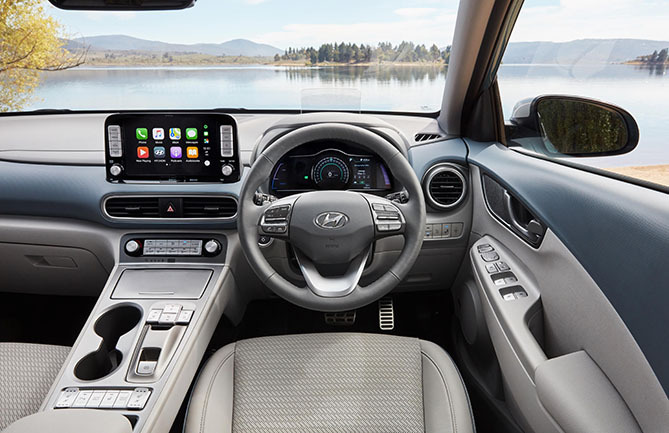 There’s a pretty comprehensive suite of safety features on board, with the Kona Electric equipped with Hyundai’s SmartSense safety package as standard in both model grades. 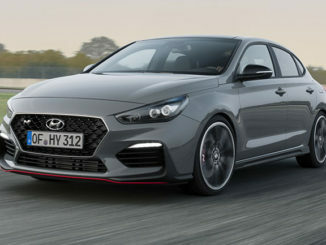 The package includes Forward Collision Avoidance Assist (FCA), Forward Collision Warning (FCW), Smart Cruise Control (SCC) with Stop & Go and Driver-Attention Warning (DAW). 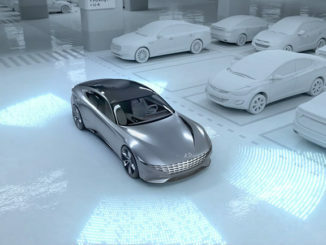 There are also Lane Keeping Assist (LKA) and Blind-Spot Collision Warning (BCW) systems, the latter including Rear Cross Traffic Collision Warning (RCCW). A standard 8.0-inch satellite navigation multimedia system boasts an array of connectivity including Apple CarPlay and Android Auto smartphone interfaces, as well as Bluetooth for phone calls and streaming audio. The multimedia unit also features an 8-speaker Infinity premium audio system, incorporating a subwoofer and external amplifier, with DAB+ digital radio. The Highlander model brings a glass sunroof, Wireless (Qi standard) inductive smartphone charging, power-operated heated/ventilated front seats, and a heated steering wheel. There are also a head-up display (HUD), High Beam Assist (HBA), front park-assist systems as well as LED headlights and taillights, on the Highlander model. 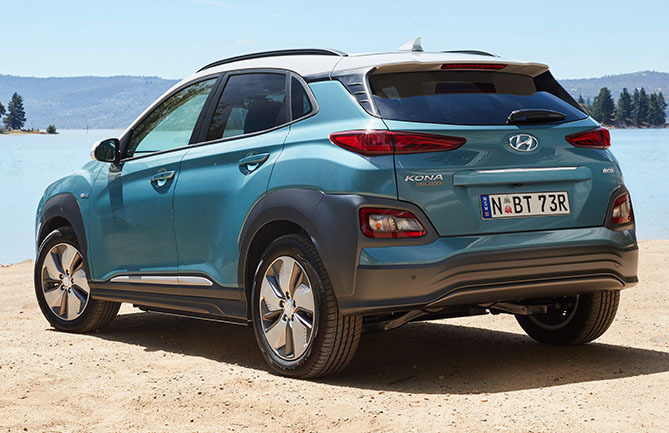 Hyundai says the Kona is built around a rigid monocoque featuring extensive use of high strength and ultra-high strength steel and also benefits from a local chassis tune developed to deliver a quiet and comfortable ride. 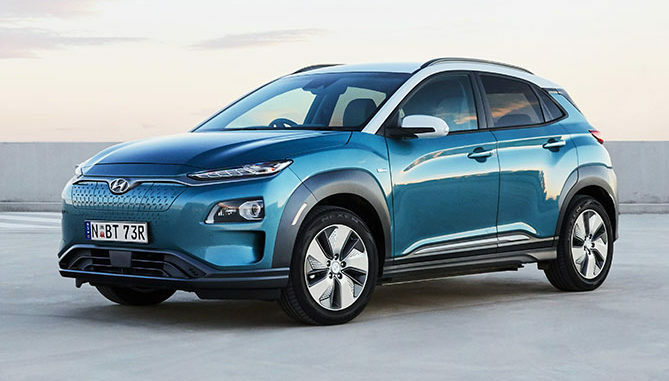 “We’re excited to bring long-range, eco-friendly electrified driving within reach of everyone with the stylish Kona Electric small SUV,“ said JW Lee, Hyundai Motor Company Australia CEO.